Travel with Trust: Designing for Women’s Safety in Autonomous Rideshares. Stamp works with a multi-disciplinary team focused on digital-physical design. 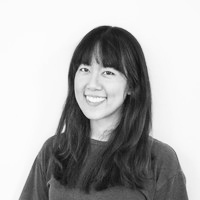 She is part of TEAGUE Labs, a think tank exploring the future of mobility. The majority of Uber and Lyft passengers are women, but understandably, many still have concerns about their safety during their trips. Their concern is justified. Between 2012 and 2015 alone, there have been anywhere from 170 to 6160 reported cases of sexual assault incidents in rideshares. It’s a difficult statistic to quantify; as the #MeToo movement recently brought to our attention, many cases of harassment and sexual assault of not only women, but people of all genders and orientations are not reported. In addition to the very real risk of assault that comes with today’s rideshare experience, 76 percent of women are skeptical driverless cars will be safe. With Uber and Lyft now offering pilot autonomous rides, the combination of rideshare and autonomous driving is fast approaching. There are new, unique design challenges emerging around ensuring that women and other vulnerable groups of people, such as children and the elderly, feel safe. The intersection of security, mobility, and comfort: What we’ve learned so far. Through various projects at TEAGUE over the last few years, we've steeped ourselves in thinking about what it means for people to trust autonomous vehicles. While we’ve only just begun to scratch the surface, here are some insights on what we’ve learned about designing inclusively. 1. We need to rethink what safety looks and feels like once a driver is no longer in the picture. Even though driverless cars eliminate the anxiety of a potentially dangerous driver, they could also lead to less accountability. Designers and engineers will need to consider ways to make people feel safe and secure without a driver present. Fortunately, autonomous vehicles will come equipped with sensing technologies, both inside and outside of the vehicle. We can leverage these devices in our design work to ensure people feel safe and in control. Responsible drivers would protect the vehicle from intruders, but driverless cars could deliver even better supervision. Together with vehicle-equipped technologies, human assistants can remotely monitor for, and respond to, any potentially dangerous situations. For example, the system could detect sounds of conflict or hostile language through the in-vehicle conversational interface and alert emergency assistants to carry out appropriate intervention. This concept of remote yet technology-enhanced safety supervision was one that we explored in depth during our autonomous school bus experiment: Hannah. Vulnerable persons such as children traveling to school, while once difficult to monitor in large groups, would be more safe and secure in a rideshare-like environment with powerful on-board operation systems and real-time interior and exterior cameras to keep an eye on them at all times. This combination of sensors and cameras inside and outside of our future vehicles could also deter abusive behavior before it happens. For example, an internally facing camera could allow passengers to check the summoned car’s interior. The availability of devices and accessibility to information would improve liability issues when unexpected accidents or inappropriate incidents occur, putting vulnerable passengers in control of their situation from the onset all the way through to their final destination. 2. We will need to design safe and discreet “exit strategies” for uncomfortable situations. As a result of anxiety and fear of victimization, intimidating and violent acts against women often go unnoticed or unreported. These offenses towards women also tend to happen in private settings or in unsupervised public spaces. How would this be handled in a half-private, half-public moving space like autonomous rideshare vehicles? Our designs will need to provide safe exit strategies during uncomfortable or dangerous situations. Should a passenger feel unsafe, they can chose to be dropped off near their destination, instead of directly in front of their home. During a recent partnership with Intel where we dove deep into, and set precedence for, the future of autonomous car interactions, TEAGUE experimented with and prototyped discreet intercommunications on personal devices to enable safe exits. We found that voice interactions and shared touch screens are important means of controlling an autonomous vehicle, but it would still be important to provide the ability to silently opt out of one's trip via a personal device, or even seat controls. For example, passengers could use their mobile phone to select a verified “safe space” drop-off location if they feel threatened, rather than ending their trips in front of their homes. According to test groups during our work with Intel, voice interaction was shown to be most effective in time-sensitive situations. Verbal commands are a great way to trigger preset safety protocols. Passengers could use a safe word or phrase to reroute their vehicle to a police station. This serves as a discreet way to control the vehicle, regardless of the availability of a personal device. 3. We should consider different social contexts and their unique requirements. Safety has social context. The context is different if you’re young or old, male or female; different if you’re in a familiar place or a foreign place; different if you’re with friends or strangers; different if you’re alone or with kids. Future autonomous systems will need to be aware of these varying physical and social settings, and will need to be able to respond appropriately to these different contexts. They could do this by extending the notion of personalization beyond typical preferences to personal safety. 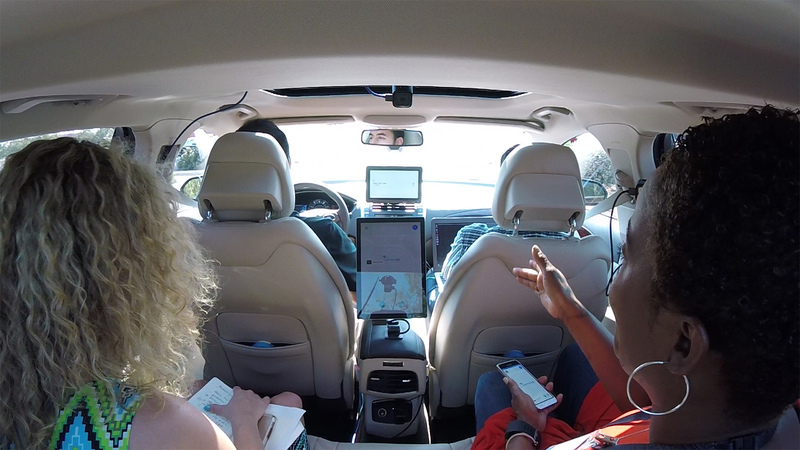 In an autonomous rideshare scenario, the system could utilize user profiles, trip history, as well as location- and time-based information. Combined with fleet-level information to provide contextualized safety recommendations, rideshare passengers would be granted a new kind of control over their trip. For example, an autonomous system could suggest a route through a populated area at night, instead of only suggesting time-efficient or scenic (yet deserted) routes. Women’s safety concerns also tend to change based on the people they’re traveling with. When traveling with children, passengers appreciate friendly alerts such as “Young children should not be sitting in this seat due to potential risks from airbags”. The autonomous system could make use of available profile information and equipped sensing technologies to identify the passengers inside the vehicle, and respond accordingly to improve safety and accessibility. If a passenger is older or physically-challenged, the vehicle could stop a little longer when dropping them off and notify their preferred contact for assistance at the destination. Safety has long been a key differentiator for automotive brands — especially for women and families. However, many women are still concerned about how autonomous cars will behave when emergency situations arise, and how the technology will handle itself. Autonomous rideshare providers will have to go the extra mile to ensure all their passengers feel safe during their travels. 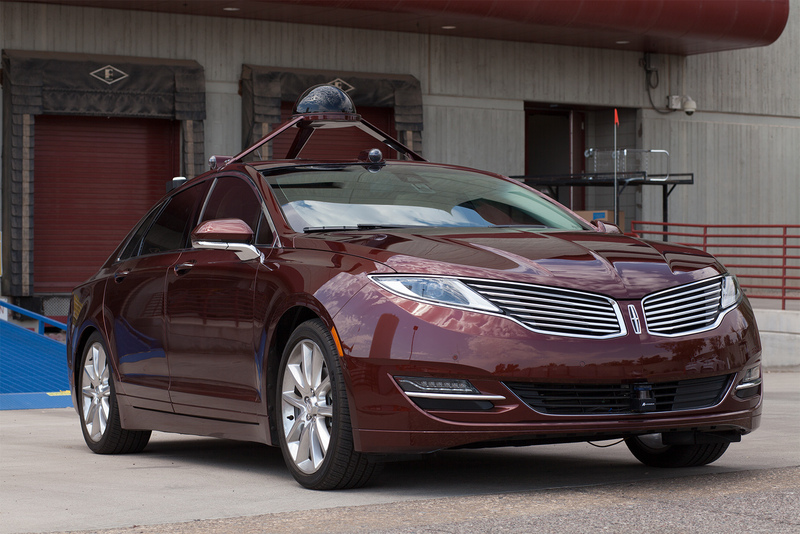 Through our research, TEAGUE has learned brand reputation is a key component in making people feel more safe and confident in autonomous vehicles. In order to build trust in rideshare brands, the experiences they’re providing must be designed for transparency. In the future, the choice of which rideshare operator to go with may be more about how well a fleet operates: the number of incidents, the accident rate, the amount of miles it has “driven” as a collective, how quickly it can reroute, or how smooth the drive is based on what the algorithm has learned. Sharing fleet-level operational data with the public would allow brands to build trust and set themselves apart. Uber and Lyft have constantly been under fire for their troublesome privacy policies, from always-on location tracking to “God View” scandals. Brands will have to rethink how transparent they are with customers and the information they’re collecting from them. People are trading more information now than ever before for personalized services, and autonomous systems would be capable of gathering even more extensive amounts of data. Companies can get ahead of the curve through candor and by educating passengers on just what their systems are doing with the data they’re collecting. Even better, brands should consider letting users decide exactly what aspects of their data shadow they would like to allow the AI and machine learning to have access to. The future is coming fast. This time, we can do things right. While many of these problems seem like a distant concern, for the vast majority of women—and other vulnerable groups—the transit system we know and use today already needs significant improvements. There is a lack of inclusiveness and diversity throughout the planning, implementation, and operation of the system, and without proper thought, this will extend into our transportation of tomorrow. The promise of autonomous vehicles is to provide safer mobility for all, so it’s crucial for everyone to play a part in designing and testing them. We urge businesses to invite more women and underrepresented groups to work together on these problems. Now more than ever, we must challenge what we have come to accept in current mobility services. And this time, get it right. To learn more about our work in autonomous vehicle interactions, our thoughts on the future of ridesharing and inclusion, or to partner with us on a project to shape the future of mobility, reach out to our team at business@teague.com.